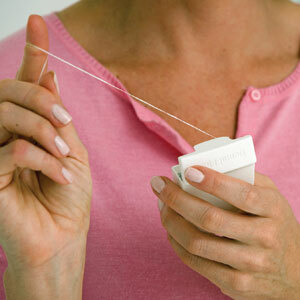 You Should Brush and Floss Around Your Implant to Ensure its Longevity - Steven L. Rauwerdink, D.D.S. With a 95%-plus success rate, dental implants are an effective and durable replacement for lost teeth. But we can't place them and forget them: if you don't clean and maintain them they could fail as a result of disease. The inorganic materials that make up the implant aren't in danger of infection. But the living gums and bone that surround and support the implant are at risk. In fact, there's a particular periodontal (gum) disease involving implants called peri-implantitis (“peri” – around; implant “itis” – inflammation). Peri-implantitis begins when the gum tissues around the implant become infected and inflamed. This happens most commonly because plaque, a thin film of bacteria and food particles, builds up on implant surfaces. Another less frequent cause is a buildup of excess cement used to bond the crown to the implant. We need to remove the built-up plaque or the excess cement during your dental visit. If the infection isn't treated or you don't keep up effective, daily hygiene practices, the infection can grow and extend deeper into the tissues and finally the bone. This can destroy the all-important integration of bone and metal titanium post that has created the implant's strong hold. When that support becomes compromised the implant can lose its attachment and, if untreated, eventually fail. It's important to keep an eye out for any indications you may have a gum infection around an implant. Look for redness, swelling, bleeding or pus formation. If the implant feels loose, this may mean that extensive bone loss has already occurred. If you encounter any of these signs, see us immediately for an examination. The best approach, though, is to prevent peri-implantitis in the first place. So, brush and floss daily around your implant as you do your natural teeth. And be sure you keep up regular dental cleanings and checkups. With proper care and maintenance you can avoid problems with disease that could affect your implant. Healthy gums and bone will ensure your implant will last for many decades to come. If you would like more information on preventing disease involving your dental implants, please contact us or schedule an appointment for a consultation.